ventually all bikes become classics. It’s not about popularity, scarcity or fashion – it’s about patience. Wait for long enough, and even the most commonplace, the most unpopular or the ugliest bikes will become desirable collectors’ items, commanding good money on the eBay of the future. Most some of us haven’t got a spare 40 years to wait for that to happen, but help is at hand in the shape of a modern classic; retro bikes designed to look like those that already have collectable status – but which don’t share the stratospheric price tags. 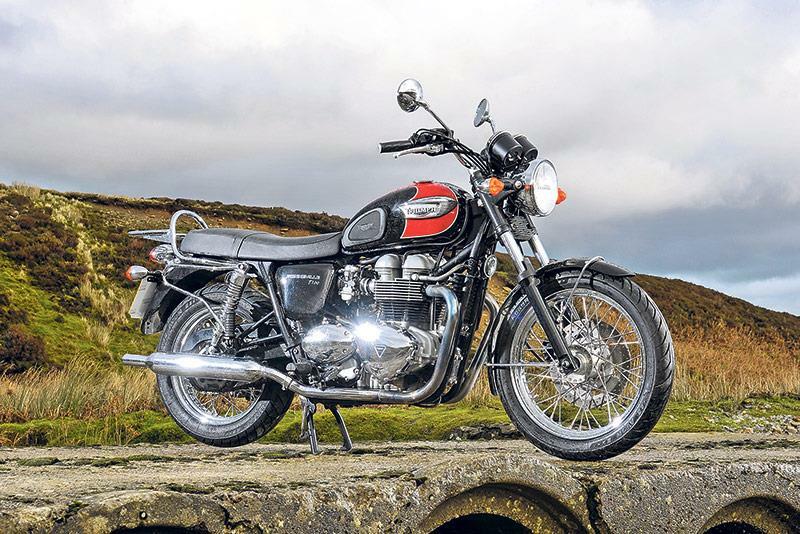 While the new crop of Bonnevilles, Scramblers and Street Trackers are all priced with the market in mind, they’re still a lot of moolah. However, there is a cheaper route to retro hedonism, and that’s to buy a used example of the bikes that were quietly thumping away in the background before lumberjack shirt sales became inversely proportional to the decline in Gillette’s fortunes. We test three of the best. There’s a pop culture theory that says if you remain true to your vision and steadfastly refuse to follow fashion, you might be out of favour for a while but eventually the world shifts and the masses will come round to your way of thinking. Just keep banging your particular drum and, sooner or later, everyone realises, actually, you were on to something all along. You just have to wait for your moment. For Royal Enfield the waiting could be over and that moment could be now. Always a famous name – established in 1893, it’s the world’s oldest motorcycle manufacturer in continuous production – in 1971 Enfield ceased assembling its by-then Indian-made components in the UK, and became a wholly Indian company building humble, low-powered, air-cooled, single overhead valve 350 and 500cc singles. Their simplicity and ease of repair suited life on the subcontinent, but through the 1980s and 1990s they meant little to Europe’s buyers. 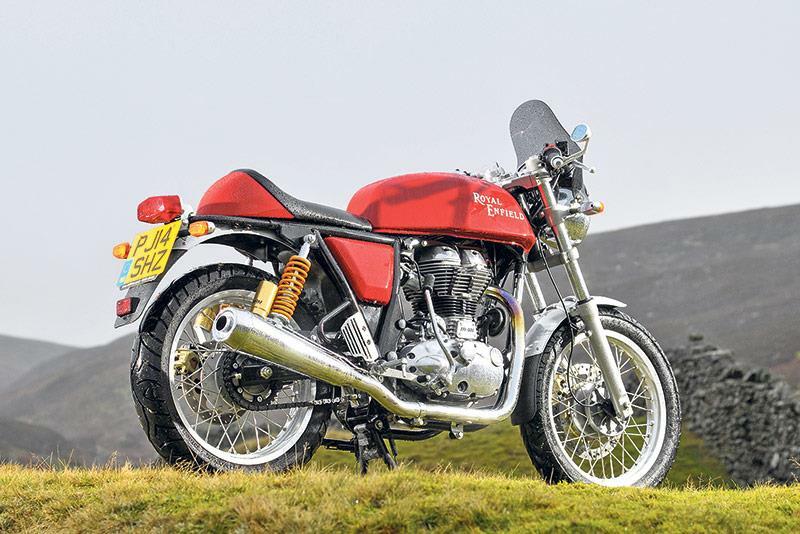 But after decades of exposure to multi-cylinder engines, spiralling revs and horsepower, and electronic sophistication to shame NASA, suddenly the back-to-basics appeal of a Royal Enfield – largely unchanged bar a few inevitable concessions (such as fuel injection) – is finding a resonance with young and old bikers alike. In a complex and confusing world, a reminder of a simpler time might well be worth having. And some of the Continental GT’s detailing is pure loveliness whatever its age; the alloy filler cap, red stitching on the single seat, wire rims, polished alloy cases, Paioli twin piggy-back shocks in Öhlins-esque yellow and gold. I even love the centrestand lift handle; a plain loop of steel by the seat. Mind you, sturdier switchgear, decent indicators and bar-end mirrors that work would also be nice. But it’s impossible not to smile as the 535cc single – a nearly-new example from Billau Motorcycles in Darlington – choffs into life with the pulsating throb of a lightly hammered thumb. Neutral is hard to find, engine running or not, so chances are you’ll feel the clutch dragging you forward as you press the start button and the motor turns over before firing. But all the authentic vintage touches are here – a kickstart (if you prefer it to the electric starter), a bar-mounted choke lever to tickle the fuel injection, and the primary vibration of an unbalanced, undersquare single piston flinging up and down a long, 90mm stroke with admirable enthusiasm given the distance it has to travel. As well as placing a 5750rpm rev limit on the motor and restricting power to 29bhp, the slow, rhythmic churning gives you a strong sensation of chaotic metal barging about beneath – as does the whirring noise, which sounds like backlash in the crank-driven cam gears. The GT’s café racer styling gives it a low, compact and sporty riding position but, with above-yoke clip-ons, it’s not too extreme. The bike is so light and minimal it requires almost no effort to ride, and flicks from side to side easily. First gear goes home with a clonk – the lever has been on the left side since the late 1990s – and the motor accumulates pace steadily, at a rate that feels in keeping with the rest of the bike. The GT is about as quick as a sports 125, but that’s fine because its sensation of speed is entirely related to the environment – and if you stick to back roads and urban limits, it’s easy to slip into a laid back, 1950’s mind-set. Besides, although the five-speed box will eventually coax the GT up to around 80mph, the idea of holding it at that speed for long on a motorway is unthinkable – the vibes, which are so charming and charismatic bopping about the lanes, quickly become intolerable on the open road. But there’s no getting away from the Royal Enfield’s charm; brapping about is a genuine delight – as long as you come to the bike armed with the understanding this is a strictly vintage experience. As a utility motorcycle it makes no sense, even in India where other bikes have long since usurped the Enfield’s prestige position. Yet here in Europe the tide has turned the other way and the Continental GT offers an alternative to high tech, high performance and high expectations. Like a line drawing from a 1950s copy of The Motor Cycle made real, the GT makes a virtue out of all the things we’d once have called vices. Over the years it hasn’t really changed... but maybe we have. When it comes to modern classics, Triumph arguably boss the territory. Or at least, with the Bonneville’s heritage, they should do. In 2000 the reborn Hinckley factory recognised the enormous pulling power of the iconic Bonneville name and, having put sufficient distance between their new triples and the painful memories of the last days of Meriden back in the 80s, relaunched the Bonnie to huge success. Effectively pre-dating the current back-to-basics biking scene by 15 years, the Bonnie has charm, charisma and a genuinely air-cooled classic vibe coupled with modern chassis dynamics and build quality that makes it day-to-day useful in a way the Royal Enfield can only dream of. This bike is a 23,000-mile 2007 T100 Bonneville, and it’s in fine fettle for a two-owner, six-year-old machine. The 865cc parallel twin, running a 360° crank with twin counter-balance shafts (the pistons rise and fall as a pair, firing alternately, but generating the same primary vibes as if they were a big single) is, if anything, a bit too smooth for a bike with the presence of the Bonneville name – press the starter and the motor coughs into life so quietly and politely that it might not be running at all. The motor is livelier than it looks, punting out 63bhp at 7250rpm but delivering, say Triumph, 90 per cent of its torque from 2750rpm. It gives the Bonnie enough puff to get a fair old crack on in most road environments. It’s not a hair-raising thrill every time you wind open the grip, but it’s willing enough to make a ride exciting with a steady, easily-managed power delivery. Fuelling is a bit fluffy from cold but, once up to temperature, throttle response is perfect. The Hinckley bike is a weighty beast, and takes some effort to push it around with its engine off. 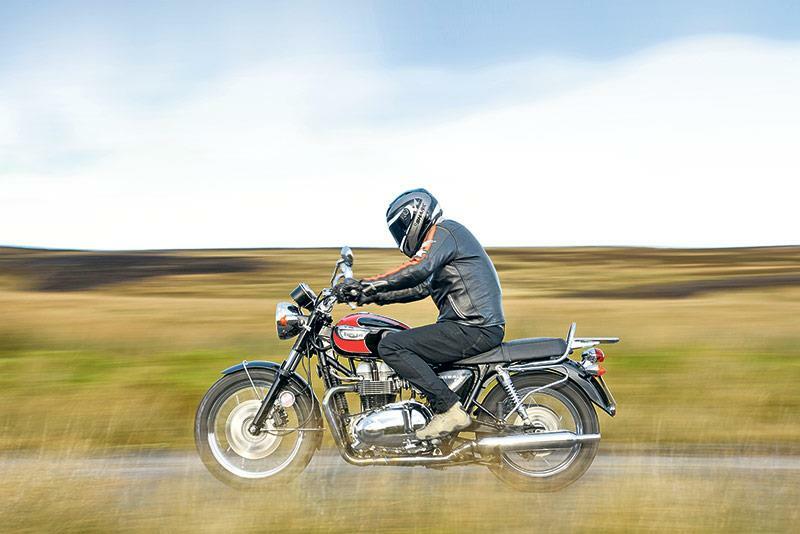 But get on the flat seat, settle into a simple, roomy, relaxed riding position with high-ish bars and feet spread wide apart by the engine’s bottom-end width, click into gear to slip quietly away, and feel how the Triumph’s low centre of gravity gives it a weightless, easy-going roll into corners. It’s solid, predictable and, on Avon Roadrider crossplies, delivers contemporary feedback and reassurance. 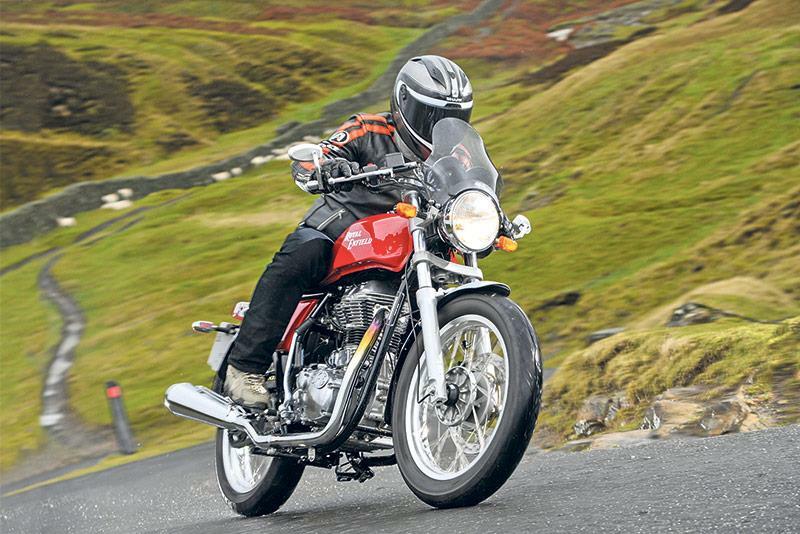 Riding the Triumph too hard would be a mistake – you’d soon discover the limitations of ground clearance, then suspension, and followed by a lack of bite from the two-pot sliding caliper and single front disc. Smoothness is the key; exuberance a wasted effort. But the Triumph has enough refinement to make motorway cruising and longer trips more than viable, while on sweeping A-roads it’s in its element. And, as a compromise between an older age and this one, the Bonneville walks the fine line with distinction. Neither too dear to be precious, too fragile to be trusted, nor too sporty to be relaxed, it’s a useable, modern classic. At the 2003 Tokyo Show, Ducati unveiled three new models which made up the Sport Classic range: the solo-seat café racer Sport1000, the sportier, half-faired Sport1000S, and the roadster GT1000. Each shared the same basic frame and engine – steel trellis and air-cooled four-valve Desmodue 992cc motor from the 1000DS making just over 90bhp at 8000rpm. But chassis details and spec level varied from bike to bike: all three shared the same inverted 43mm Marzocchi fork and Excel rims, but the Sport1000S got an adjustable Öhlins monoshock, the Sport1000 an adjustable Sachs monoshock, and the Sport1000S had twin unbranded shocks. Styled by bike designer Pierre Terblanche – ironically, the same man now leading Royal Enfield’s styling – the Sport Classics went on sale in 2006, with the GT1000 lasting longest and staying in production until 2010. But despite a warm reception from the press, the Sport Classic’s high price tags and lukewarm public interest meant sales were disappointing. Hard to believe in the days of the Scrambler’s success, they were well ahead of their time, and we just weren’t ready for a modern classic Ducati. 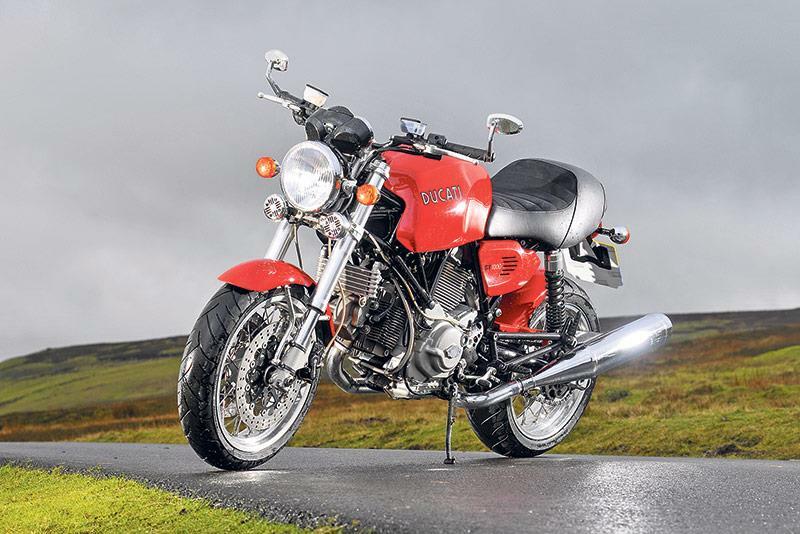 But that also means today, prices for the short-lived Sport Classic range are crazy strong – with the most scarce, the Sport1000S, being the most highly prized. Yet with low clip-ons and a high seat, the Sport1000S is also back-breakingly uncomfortable and the least pleasant of the three to ride. The GT1000 is a much better bet; the most sensible of the three Sport Classics both to buy and to use. And, standing in the rain on a Yorkshire hillside, this 7800-mile old Italian looks stunning in its fiery red livery. This bike’s seat has been customised to match the solo seat profile of the café racer Sport1000. A pair of horns have found their way onto the bike in the past, and other add-ons include bar-end mirrors, a tail tidy and a red rear hugger. Hitting the Ducati’s starter initiates the usual heaving, will-it/won’t-it lumpy turn-over before firing – remember to keep the throttle shut tight to avoid pumping fuel into the cylinders. But when it fires up, the V-twin settles into a typically shuddering, grunty tickover. Flat Rizoma aftermarket bars give the riding position a nicely balanced tilt over the front end, and that plus a low kerb weight, a high centre of gravity and a decent fistful of power means the GT1000 instantly feels game for a laugh and more conventionally sporty than the other bikes here. As soon as the wheels are turning and the GT1000 dives for the first apex, it obviously has so much more performance prowess on the road than either the Triumph or the Enfield. The slightest roll of the grip delivers a wave of torque to the rear Dunlop Roadsmart, lifting the Ducati’s nose and pounding into the wild wet yonder. If riding at pace is your only criterion, the Ducati will simply romp away from the others. But the Ducati’s capability also pulls it further away from the relaxed charm of the other two machines. They’re bound by limitations that place you in a specific frame of mind to enjoy the ride for the ride’s sake. You have the option to ride the Ducati gently of course – but sportiness is Ducati’s DNA. 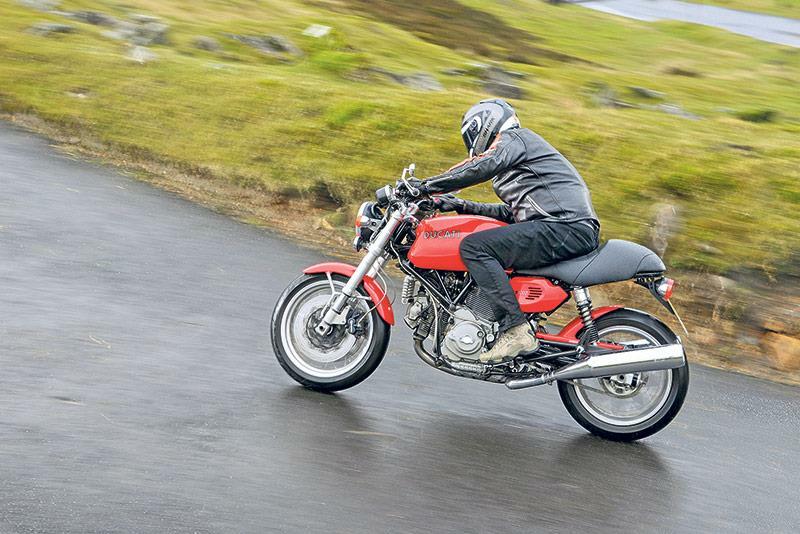 The Ducati does all the things you’d expect a contemporary bike to do: stop, go, and handle, in a way the Enfield can’t match. But it doesn’t capture – for better or worse – the authentic vintage vibe. Beautiful, yes; collectible, certainly. But maybe it’s too good. The Enfield has the attributes of a genuine, 1950s machine, but which happens to be built today. Fuel injection and digital trip notwithstanding, it goes like it could be 50 years old. Fine if that’s what you want; increasingly for many people these days, it is. The Triumph is the compromise modern classic, with something of both ideas. On the surface it has some of the genuine classic bike looks but underneath it has a level of capability that gives it the edge over the others. Neil Hodgson to join all-new MCN Revolution live action show! MCN Revolution - only 3 weeks to go! MCN Motorcycle show: Only three weeks until Revolution!